Artistic expression is a form of prayer. It can be offered in the form of dancing, playing an instrument, singing, whirling, or chanting. In our case, since we work with kids, it often appears as crafts. Caregivers around the world use crafts to teach children about their faith traditions and create perfect resources for interfaith education. (At the end of this article you’ll find links to some of these sites.) Beyond that, these projects give kids the opportunity to discover the sacred, to offer a prayer without having to put it into words, and to co-create with the divine. Here are a few crafts that we’ve used successfully with the kids in the Nurture Program at Jubilee! Community Church in Asheville, North Carolina. They are easy to complete, use inexpensive materials, and promote creativity. Rangolis come to us from the Indian/Hindu tradition. The designs, which range from the joyfully simple to the wonderfully complex, include flowers, birds, leaves, and geometric designs. Filled in with natural materials, rangolis are usually made on the ground or floor – maybe in a courtyard or just outside a front door or gate – to summon good luck, welcome guests, repel evil forces, or create a sacred space for the deities. They are often seen during Diwali and in marriage ceremonies, and are featured on Hindu holy days such as Onam and Makar Sankranti/Pongal. The colorful patterns can be achieved with flower petals or dyed rice, both of which are easily used by children. You’ll find options for dying rice here or here. Most recipes include some type of food coloring (e.g., liquid drops, gels, Kool-Aid) and a setting agent (e.g., vinegar, rubbing alcohol, hand sanitizer). You can also just use colored beans (e.g., black beans, kidney beans, pinto beans, navy beans, split peas, lentils). Find a pattern online using a search term like “rangoli pattern templates,” supply a bit of glue, and let the kids create! The mosque is the quintessential house of worship for Islam. All mosques have a prayer hall and a niche wall that indicates the direction of Mecca. Most also have a minaret, and many have one or more domes. Beyond that, mosque architecture varies widely depending on its location and when it was built. In an attempt to discourage idol worship, Islam has historically used images very judiciously, if at all. Instead, they enjoy a rich tradition of calligraphy, geometric design, and mosaics. Crafts using shapes and bright colors are perfect for kids. The project shown on the left gave us a chance to share pictures of beautiful mosques from around the world, to discuss Islamic artistic practices, and to encourage them to create their own unique image. A variety of similar projects can be found on the internet. For this one, we made a template from this coloring page. We photocopied it onto light purple cardstock and then used an X-Acto knife to cut holes for the windows. The kids then glued small pieces of tissue paper to the back of the image and colored the front. This picture, made by one of our Upper Elementary students, was then cut out and mounted on a piece of black construction paper. Another great project for kids is creating a sand mandala. Traditional sand mandalas from the Tibetan Buddhist tradition hold layers of meaning. They can represent the ideal world, an imaginary palace, an aspect of wisdom, or a meditational deity, and some of the related teachings can be highly esoteric. The application of the sand is a delicate process. The grains are applied a little at a time using a tool called a chak-pur. The ridges along the side of the metal funnel are stroked with a metal scraper. The vibrations move the sand along the funnel, out the hole, and onto the hand-drawn geometric design. The public creation and dissolution of Tibetan sand mandalas has become a popular practice in the U.S., and many people have had the privilege of seeing Buddhist priests construct one. Our kids have made sand mandalas on many occasions. The one shown on the right was for autumn. Our circular image contained various leaf patterns. The kids simply applied liquid glue to a small area of the mandala with a paint brush. Then, they covered it with sand. We usually buy our colored sand, but you can make your own using dry tempura paint powder or food coloring. In general, the kids use their hands to apply the sand, but we also have a chak-pur they like to try. The one shown here costs about $25 at a Buddhist supply store. It applies the grains of sand very lightly, and even preschoolers can use it. We just pass it around and let them get a feel for it. The purpose of sand mandalas is to promote contemplation, to generate compassion, and to radiate healing power. In many ways, this is the point of all artistic endeavors, and kids’ crafts are no exception. We have the great privilege of watching the joy on their faces when they create something that is totally their own. Even when the same pattern is used for everyone, no two finished products ever look identical. Each one is a unique expression of who that child is, and each one provides a glimpse into an inner world full of curiosity, wonder, and delight. One never knows where such craftsmanship might lead. Mozart was composing by the age of five, and Pablo Picasso completed his first painting, Le Picador, at age nine. We are not in the business of identifying future prodigies. But we are definitely in the business of facilitating the creative process, helping kids touch their true selves, and lifting up their sacred endeavors. If we can help them connect with their own faith, and those of others along the way, all the better. 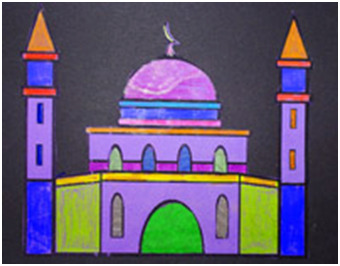 Here are additional resources full of great faith/interfaith craft ideas for kids. Older PostGod Is Good, No Matter What You Call Her!